Strickland Engineering, LLC is a consulting engineering and land surveying firm based in Jackson, Missouri. Established in 1979, the company provides mechanical, electrical, plumbing, civil and survey services to a wide range of clients, particularly the educational, senior living/healthcare and commercial sectors. “When we see a need for something the software doesn’t do, we send our ‘wish list’ to Design Master. They’re very good about incorporating our requests into the next update,” Mr. Strickland relates. “Design Master enables us to do more with the same resources, and to work ‘leaner and meaner’,” Mr. Strickland asserts. Says Mr. Strickland, “Every job we do is ‘We needed it two weeks ago!’ and they’re making changes the day we’re trying to send out the drawings. So the ability to make changes and check them for accuracy quickly is very important. “For what we do as engineers, Design Master is a whole lot easier to work with than Revit MEP,” Mr. Wright summarizes. 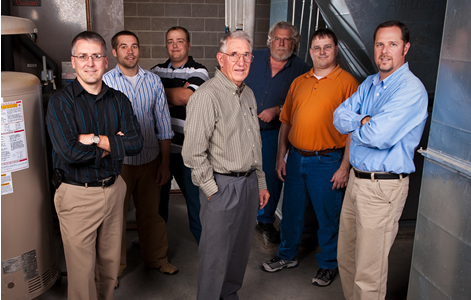 “We like to think that Strickland Engineering is a good place to work,” relates Mr. Strickland. “We have almost no employee turnover, and even our newest employee has been with us over five years. “I second that!” echoes Mr. Wright.